I am not a religious person, let alone a follower of Christian teachings and practices, so Christmas and Easter are more or less cultural celebrations for me. I do treat such holidays with respect for its origins though, and I’m mindful not to allow them to become meaningless commercial exercises. I am as materialistic as they come but I detest seeing supermarkets bring out chocolate Easter eggs at the end of January when they’ve only just managed to move the half-price Christmas goods. It’s so spiritually bankrupt! 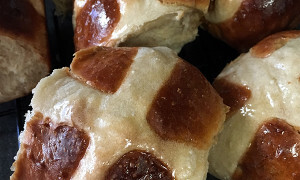 I am however very fond of Hot Cross Buns (HCB) and I’ll admit to have already bought a dozen or two, a month shy of Easter. As dismayed as I was to see them debut so soon at Woolworths in January, I could only resist them for so long. By March I was eagerly dispensing them as a quick and easy breakfast to the kids. I suppose I could accompany them with a sermon about how Christ bore our sins on the cross to make things more meaningful but somehow I think the kids would prefer watching Ben 10. The premature appearance of HCB is one thing but I am also a little irked by the dazzling array of flavours they are produced in these days; chocolate, chocolate chip, chocolate & chocolate chip, chocolate and raspberry, and of course, fruitless. Sheesh. They’ll be coming out with crossless ones for atheists soon enough! 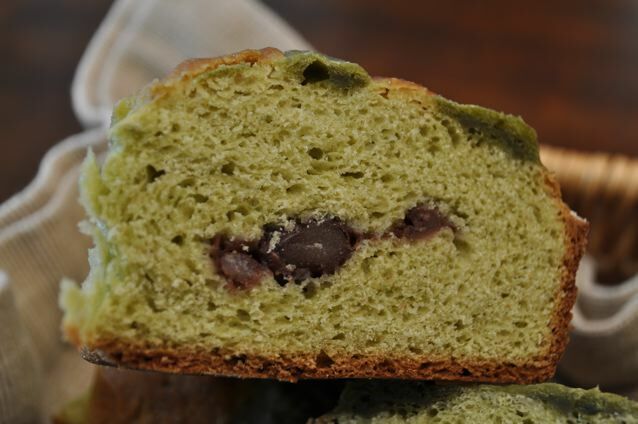 Not one to ignore a trend, I decided to make my own non-traditional HCB flavoured with green tea (matcha) and filled with sweet red bean (azuki). This concept is not at all new of course. Azuki (or anko for azuki paste) filled buns are totally old-school in Japan and there’s even a much loved cartoon character whose head is one big anko filled bun (Anpan-man). 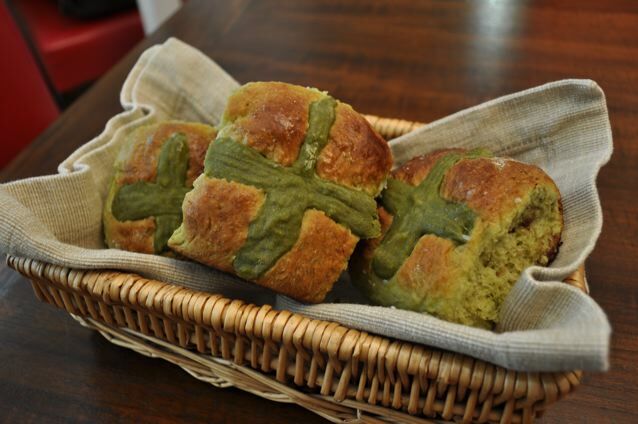 It wasn’t much of a stretch to start producing green tea bread and buns and you’ll see them throughout Asia these days. 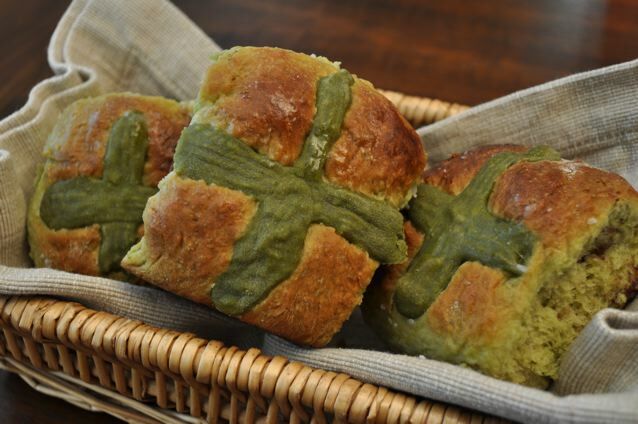 But a green tea hot cross bun? Rejoice my Asian Christian people! The basic recipe comes courtesy of Gourmet Traveller and only a few minor changes were needed to produce these fragrant beauties. 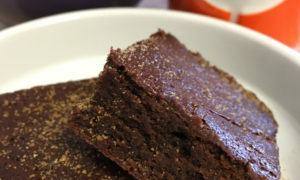 Instead of all the fruit and spices, I used a couple of teaspoons of matcha powder and brown sugar instead of plainwhite to complement the earthy green tea flavour. I used a tin of cooked and sweetened azuki beans for my filling but you can of course puree the content into anko for a more smooth filling. Cooking with green tea powder is often a process of trial and error but we got it right the first time with a couple of teaspoons; just enough to give the dough a good colour, wonderful scent and subtle flavour. Happily the green remained the right hue and saturation post-baking too, and the flour paste really came out matcha green. I was probably a little light-handed with the azuki and will put twice the amount in next time. To make: Combine flour, sugar, yeast, green tea powder and and 1 tsp sea salt in a bowl. Gently warm milk and butter over a low heat until butter melts and mixture is tepid. Add egg to milk mixture and whisk. Make a well in the centre of flour mixture, add milk mixture and stir. Turn dough onto a floured surface and knead for 10 minutes or until smooth (I placed all ingredients into my stand mixer and used the dough hook to knead). Place dough in a lightly oiled bowl, cover with plastic wrap and stand in a warm place for 40 minutes or until doubled in size. I am a fan of placing dough in the fridge to bring out extra flavour so if you have time, let the dough sit in the fridge for an hour or two. Once out, start the 40 minute proofing process. Knock back dough and cut into 2 equal pieces. Spread dough out and spread some azuki in centre and roll like a swiss roll. 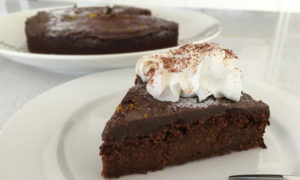 Cut into four pieces (to make 8 in total) and place in a lightly greased 22cm-square cake pan. Cover with a damp tea towel and stand in a warm place for 40 minutes or until doubled in size. Preheat oven to 220C. 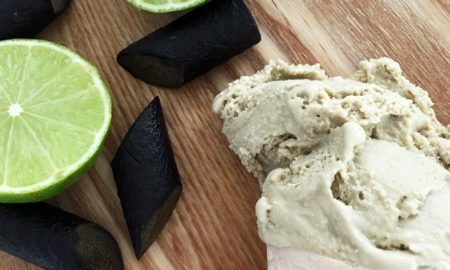 Combine remaining flour, 1/2 tsp green tea powder and 2 tbsp water and stir to a smooth paste. Spoon into a piping bag fitted with a fine nozzle. Pipe lines down each row to form crosses. Bake for 10 minutes, then reduce temperature to 200C and bake for another 10 minutes or until golden. (They’re ready when they sound hollow when tapped). For glaze, combine ingredients with ¼ cup water in a saucepan over medium heat, stirring until sugar dissolves. Bring to the boil, reduce heat and simmer for 1-2 minutes. Brush glaze over hot buns, then transfer to a wire rack to cool. I love Ben10! I have just come off a marathon evening viewing.. anyway. I love HCBs! did you use your TMX to make or another stand mixer? I am waiting for my new oven to bring on the HCB goodness! I love green tea flavoured baked goods. You are right that cooking with green tea powder is a process of trial and error. When I made my first batch of green tea cupcakes I used a basic vanilla cupcake recipe and then just added in some matcha powder, it took me a few tries to determine how much matcha to add to the cupcakes to get a nice flavour. I also don’t like that fact that all the shops are starting to bring out holiday goods earlier each year. These are genius. Love that green! I’m such a sucker for green sweet goods. I’m not sure I approve of all the new types of HCBs but these are pretty awesome. I am so going to use your recipe next year. Bookmarked! Wanted to make it this year but we were away. Love the idea. Brilliant, Monica. Thanks Ellie :) I liked the subtlety of green tea :D Will keep eyes peeled for your version next Easter.